The coaster brake has been in constant use on bicycles for over a century, but it seems to get no respect. Compared to other bicycle components such as wheels, derailleurs, shifters, rims or tires, the bicycling community does not pay much attention to coaster brakes. The probable reason is that they are found mostly on low-cost bicycles. Despite this lack of respect, coaster brakes are still sold in high volumes in the USA and throughout the world. 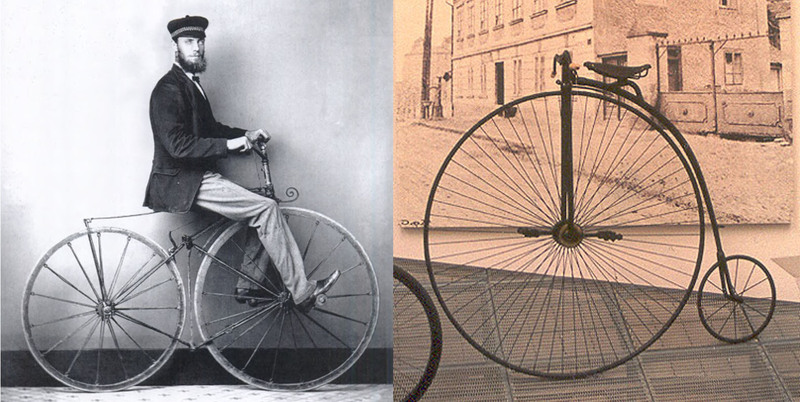 In addition, they were a key invention during the 1890s, an era when innovations defined the modern bicycle. The enduring popularity of the coaster brake is because of its simplicity and reliability. Capturing this sentiment, one advertisement by Pure Cycles describes one of its models as follows. “Featuring a hands-free coaster brake for easy stops, swept-back bars for a comfy, upright ride, and a steel frame to soften the road, this bike is perfect for quick errands, slow rolls, and all of those late-night party rides.” In fifty or sixty years this bicycle might come out of a basement or garage ready to ride with perfectly functioning coaster brakes. My curiosity about coaster brakes was piqued when recently I assembled, greased and reassembled an over 40 year old Bendix 70 model that was on a Columbia bicycle. As a result of this project, I decided to take a closer look at the origins of the coaster brake. 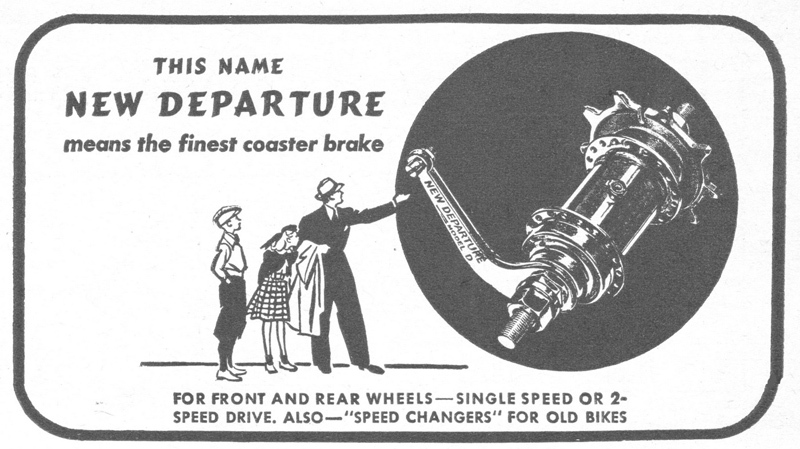 Prior to the invention of the coaster brake, many bicycles had front wheel pedal drive systems. The cranks and pedals connected directly to the front wheel. For stopping a bicycle in the 1870s and 1880s, the rider would either use handbrakes or simply resisting pedaling. The hand brakes of the time were getting better, but with poor quality rims combined with heavy bicycles, stopping could be an adventure. The resistance method of stopping involves reversing the direction of pressure on the pedals in the same way as some fixed gear bicycles today. The “gearing” in such a direct drive front wheel system was determined by the size of the wheel. The larger wheel covered more ground in one pedal stroke and therefore was faster than a bicycle with a smaller front wheel. The reason for the advent of the high wheel bicycles was to achieve greater speeds. As an example from the 1870s, the high wheel Penny Farthing could attain higher speeds than the more moderately sized Phantom bicycle (figure 1). Figure 1. The Phantom and the Penny Farthing Bicycles in the 1870s. The next development in bicycle technology was the safety bicycle. At that time the chain drive system was rapidly replacing the system of direct-drive systems. Instead of driving the front wheel, the pedal and crank connected to a chainring at the bottom of the bike and transferred power to rear sprocket by the use of a chain. This allowed bicycle makers to reduce bicycle wheel sizes to more reasonable dimensions. On a single speed, the gear ratios could be customized to the bicycle simply by varying the size of the front chainring or rear sprocket. Having similarly sized wheels made the bicycle easier and safer to mount and dismount, and hence the name safety bicycle. The high wheelers became virtually extinct in the 1880s. Several key inventions took place in the 1880s and 1890s that would make the safety bicycle similar in appearance to bicycles today. This included the use of better rims, the pneumatic tire and the bicycle freewheel which allows a bicycle to coast. The bicycle freewheel was patented by William Van Anden in 1869. During the same time period, A. Boeuf introduced another version in France. In the 1870s the freewheel was considered too complicated and prone to failure, so very few manufacturers used them on their bicycles. The freewheel eventually was introduced to the safety bicycle in both Europe and the USA in the late 1890s, so that the rider could pedal and coast (Herlihy 2004). On the heels of the invention of the safety bicycle and rediscovery of the freewheel, Henry Townsend applied for the first coaster brake US patent. He later transferred the rights to produce the brake to New Departure of Bristol, Connecticut (figure 3). The coaster brake seems to have been simultaneously invented by several people including James Copeland (Pope Manufacturing) and William Robinson of Brooklyn, New York (Wright Aeroplane Company 2018). They all filed patents in 1898.